Your opinion matters. Leave your review of Daybreak. Our shelter is open 24 hours a day, seven days a week for youth ages 10 to 21. We provide youth with a safe place to sleep, three meals a day, and nutritious snacks. We also provide personal care items, clothing, and bus fare for transportation to school and/or work. 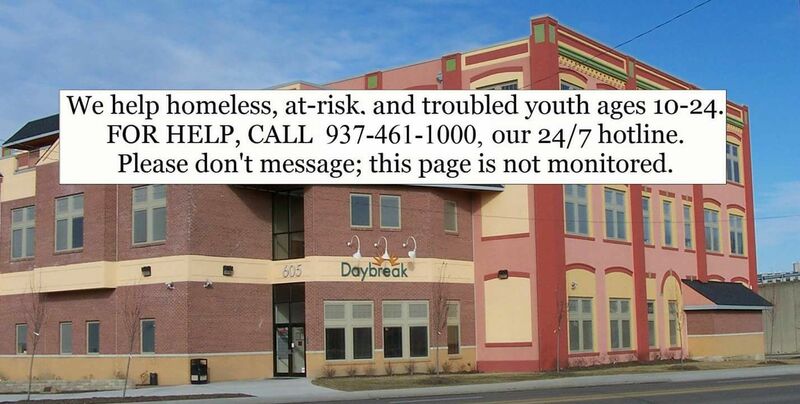 In addition to basic necessities, Daybreak provides shelter youth with individual, family, and group counseling. Youth enrolled in school attend their home school, and we work to enroll those not in school. Other services Daybreak provides include anger management training, violence prevention education, drug/alcohol/tobacco prevention, life skills training, supervised computer lab time, tutoring, and structured positive recreational activities. We also work with them to set goals for future employment. Overall, we work with them to become responsible adults. To reconcile minor youth with their families or find a safe alternative for those unable to return home. In addition to providing food, shelter, and other basic services, we provide our youth with counseling, anger management training, violence prevention education, and life skills training that will help ensure a stable return home or a safe transition to a new home. Whenever possible, we work with the entire family. To help homeless 18- to 21-year-olds secure permanent housing and develop the life skills that will help them become contributing members of society. Many of these youth have been kicked out of their homes, while others have aged out of the foster care system. All of them lack the maturity, education, and skills to make it on their own. While they're in shelter, we work with them to secure permanent housing and other supports. Some of them decide to apply to our housing program, which is the region's only program designed to move homeless youth out of homelessness, poverty, under-education, and crisis and into housing, financial independence, educational achievement, and self-sufficiency. First and foremost, we work with these 18- to 21-year-olds to ensure that they earn their high school diploma or GED. Then we explore colleges, trade schools, and other programs that can help them create a better future. We also provide employment assistance and life skills training. Do you have items to donate? Contact Daybreak at the phone number provided above to see if they can use any items you may have to donate.